This polygonal world travel map is an atlas-globe hybrid—a combination of a 2D and 3D way of representing the world. Its irregular shape lends itself perfectly to sit on a coffee table, desk, or flat surface of your choice. Trot the globe and trace your steps with these unusual travel maps. Palomar maps don’t just pose and look pretty. They're designed so you can pin and mark your journey on them, making them equal parts functional and fashionable. 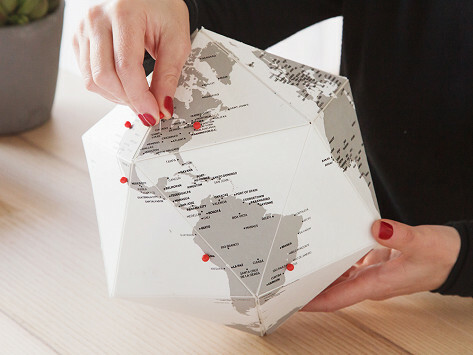 The polygonal map is made from a cotton-infused paper that’s sculpted into a 3D form. It can sit on a coffee table or desk. Also disguised as décor, the felt Palomar map hangs on a wall so you can make mapping adventures a collaborative effort. Located smack-dab in the heart of Florence, the Palomar family business has been designing navigation and cartography solutions since the 1950s. 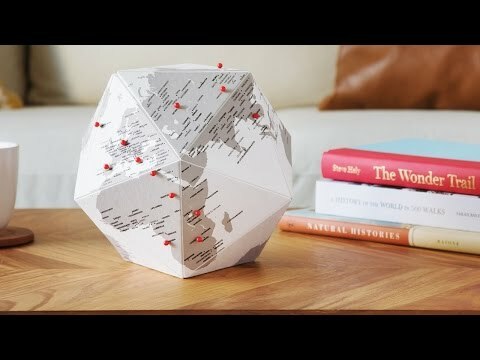 Add some worldliness to your space and quench your wanderlust with a single, innovative map.